Updated with 2019 information. Mickey’s Very Merry Christmas Party is a hard-ticket event at Walt Disney World’s Magic Kingdom. The party runs from early November through December each year and costs around $100 per ticket. In this post we’ll take a look at all the party offers, give a few tips and a touring plan and discuss whether the price of admission is too steep or worth it. As with most years, 2019 will see Mickey’s Very Merry Christmas Party starting the week after Halloween. Ticket prices are dynamic, increasing in price on the weekend or the closer you get to Christmas or Thanksgiving. The lowest ticket price has stayed the same in 2019, coming in at $99. The peak dates are where we see the price increase, with the cost rising all the way up to $139. DVC and Annual Passholders do get a $5 discount. For a look at the cost of specific dates, check out this link. Just like our Halloween post, I have a really hard time recommending the party if you have to pay much over $100. I’ll get further into why that is later in the post. For $99 (or $94 if you have a discount) the party is an okay value and I would recommend it if you enjoy Christmas or like special entertainment. As for when to buy tickets, it’s early enough that I don’t think anything will sell out. You can get your tickets now but there isn’t much rush. The one caveat I’d throw in is if you’re going to a party that’s close to Thanksgiving or Christmas or if you’re going to the very first party, then buy your tickets sooner rather than later. Ultimately, our recommendation on an ideal time for 2019 is early November on a day that’s not Friday. Most of that recommendation comes down to saving a few bucks, but the party will be less crowded. We’ll update the post with more specific 2019 information as the party gets closer. Mickey’s Very Merry Christmas Party begins at 7 PM and goes until midnight. Guests going to the party can enter Magic Kingdom at 4 PM (or anytime after) and enjoy the park before the party’s entertainment begins. During the party, most of Magic Kingdom’s attractions remain open and will have minimal waits relative to a standard day in the park. We don’t recommend using party time to do that but riding a couple of rides and grabbing some food before the actual party begins is a smart move. Party guests will enter Magic Kingdom and then receive a wrist band for the party. 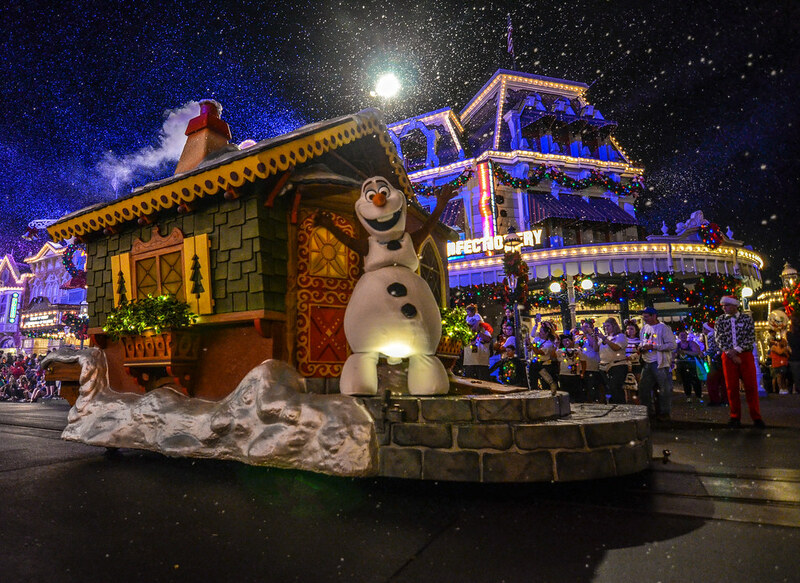 After that, guests are ushered down the Main Street bypass to see a few decorations and grab the first of the complimentary (better known as, included with the price of admission) cookies offered. After exiting the bypass the park is open and you can head in whatever direction you please. Let’s take a look at what is offered specifically for the party. During the party several characters are out and about to meet guests, including a few rare characters who aren’t out during the day. This is one of the more popular things to do at the party, especially early in the event. Guests will start lining up for certain characters over an hour before the party actually begins. I don’t enjoy meet & greets as much as others so it’s not much of a priority for me. Putting that aside, if you want to meet some characters then I’d recommend prioritizing one or two to see right at the start of the party and then drop by a few later in the night. Most characters will be sporting a Christmas outfit of some sort so that makes them fun to see. Some of the more popular characters throughout the event include Sandy Claws (Town Square Theater), Pooh and Friends (The Many Adventures of Winnie the Pooh) and the Seven Dwarfs (Storybook Circus). For all of those characters and a few others, I would plan on lining up well before the party begins. For some, the character meet & greets are one of the main reasons to buy a ticket to MVMCP. For others like me, it might be fun to see one or two but isn’t worth spending much time in line for. An easy, and possibly more fun, alternative to meeting characters is dancing with them. There are a few roaming characters throughout the evening including Peter Pan and the Country Bears. The Country Bears are especially playful in Frontierland as they dance along to some country and bluegrass music played by the Reindeer Wranglers. I thought this was a blast and far more interesting than waiting in a long line and then spending roughly 90 seconds taking a photo with characters. Of course, my love for the Country Bears might have had something to do with that. Alternatively, there is a Disney Jr. style dance party in Storybook Circus. I don’t really know those characters so I’m not going to add anything there. There’s also a crazy dance party in Cosmic Ray’s with elves and polar bears that looked suspiciously like the Coke-a-Cola mascot. When I walked in there they were dancing to N’SYNC and looked exhausted as it was around midnight. It was a weird scene but I was intrigued nonetheless. The dance parties are a fun way to interact with characters in a different manner than the parks usually offer. I wouldn’t say they add much substance but it is a good amount of fun. 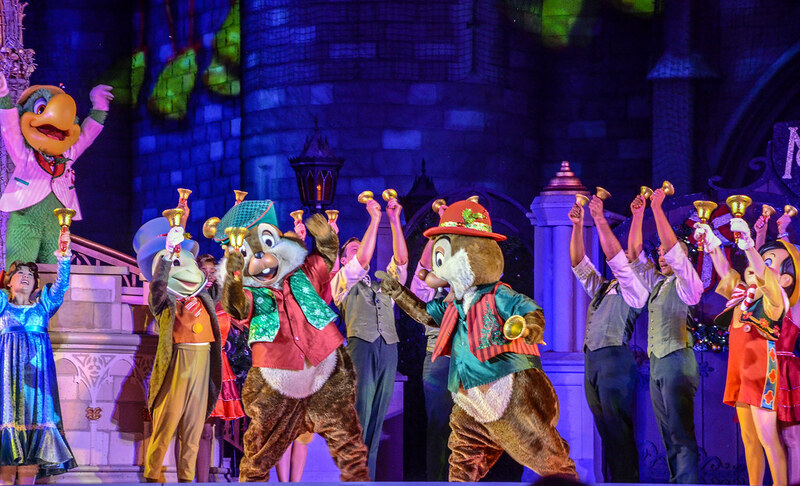 Mickey’s Most Merriest Celebration is a stage show performed in front of the castle. Mickey is throwing a Christmas Party and all of his friends are showing up to sing Christmas Carols. There isn’t a ton of plot here but it’s a good excuse for our favorite Disney characters to sing our favorite Christmas songs. There is one really dumb song during the show that doesn’t flow well. Despite a Christmas song about texting, the rest of the show is great and definitely worth seeing. 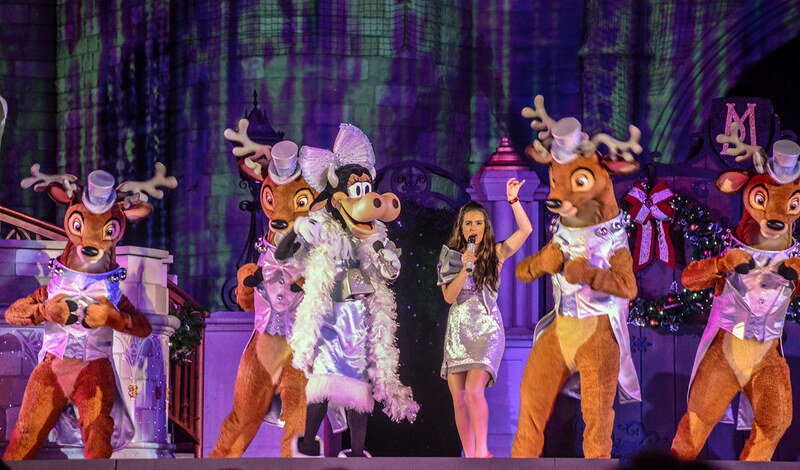 A personal highlight for me is Clarabelle Cow doing her best Mariah Carey impression while singing All I Want For Christmas. The show ends with an underrated Muppets Christmas Carol song that is touching and sweet. With its prime location and solid performances, Mickey’s Most Merriest Celebration is one of the best entertainment options at the party. The Christmas parade is excellent and probably my favorite part of the party outside of the general atmosphere (and the Country Bears running around). Toy Soldiers are an obvious highlight from the parade and are worth seeing by themselves. Along with them, the floats are a good amount of fun and the costumes are enjoyable. Mickey, Minnie, Chip and Dale in their holiday finest makes me want to dress better. Ralph and Vanellope are both in the parade, as is Santa himself! I’m not sure that this parade is any better than Boo to You at the Halloween Party, but it definitely is a highlight of MVMCP. 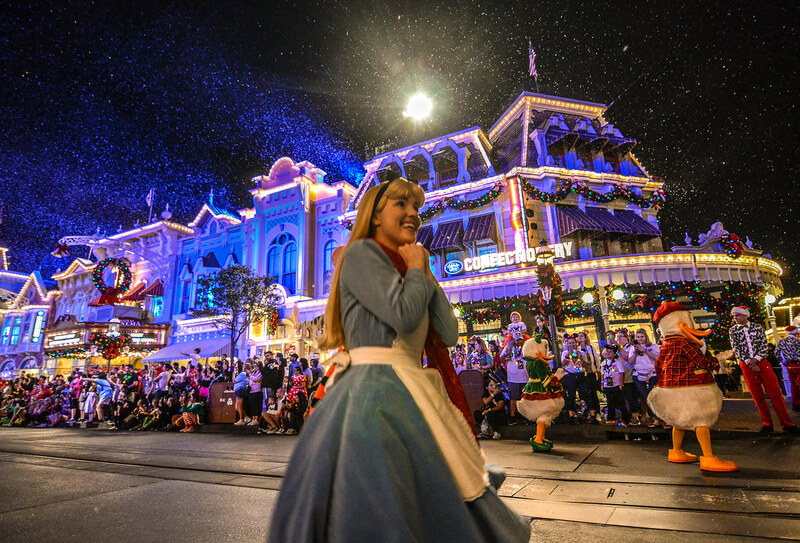 Seeing the parade on Main Street as the ‘snow’ falls is an unforgettable experience and worth saving a spot earlier in the evening just for that view. 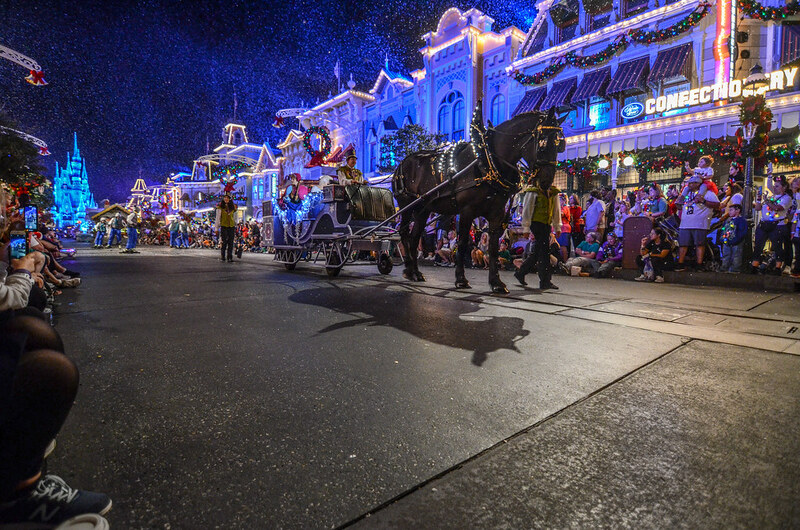 There are two showings of the parade each night. On our night, they were both equally crowded but I’ve seen plenty of people say that the second showing is less crowded if you can stay out late. 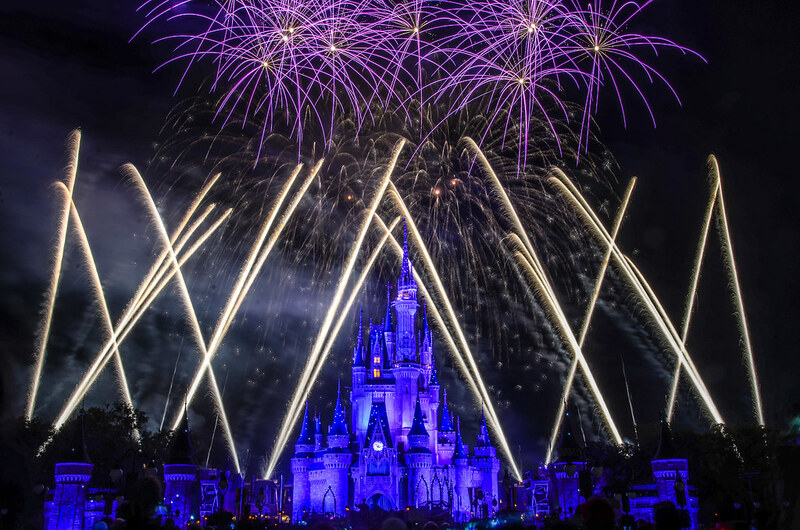 Holiday Wishes is the nighttime spectacular at the party and is a can’t miss show. The show incorporates Christmas songs along with fireworks that match the mood. While the fireworks above the castle are incredible, the perimeter bursts are a highlight so get to a spot where the views on the sides aren’t obstructed by buildings. While Holiday Wishes is a highlight and a unique show for Christmas, frankly they aren’t good as Happily Ever After. This isn’t an indictment on Holiday Wishes but rather a compliment to Magic Kingdom’s usual fireworks show. Happily Ever After uses up-to-date technology and Holiday Wishes doesn’t. This isn’t to say Holiday Wishes is a disappointment, it’s a fun and beautiful show that matches the party. Taking the stage in Tomorrowland are two different acts – A Totally Tomorrowland Christmas and The Edge Effect. A Totally Tomorrowland Christmas is a cheesy, weird show where Stitch is trying to capture(?!) Santa Claus. A few other characters show up throughout the show. Just because it is cheesy and weird doesn’t mean it’s not worth your time. While there are certainly some dumb moments that you may have to overlook, the show is somewhat fun. Not exactly a ringing endorsement but if you find the time it can be worth seeing. The Edge Effect is an a capella group who performs on that same Tomorrowland Stage. Unfortunately, they don’t all perform at the same time. That would be really crazy. Having said that, The Edge Effect offers an enjoyable performance, singing Christmas songs. While it’s not absolutely essential to the party, I would recommend seeing them perform. I’ve already broke down the cookie offerings at Mickey’s Very Merry Christmas Party. I won’t go into it very much, but taking some time to go ‘trick or treating’ for cookies is fun and well worth doing. Don’t make it the central part of your itinerary, unless you are a monster who lives on Sesame Street, but if you see a cookie spot (marked by the inflatable candy canes) then stop by. Pinocchio Village Haus offers multiple kinds of cookies so stop by there to get a variety. While that is the special entertainment offered throughout the party, I’d be remiss if I didn’t mention the appeal of Mickey’s Very Merry Christmas Party’s atmosphere. Magic Kingdom, or any castle park, has a certain allure for most due to nostalgia and the artistic design. The party doubles down on that atmosphere. Part of it is people simply being in a better mood. Everyone seems more excited to be there than a typical day at the park and loses their inhibitions slightly more. There is something else added to the atmosphere that is hard to put a finger on. We could call it Christmas spirit but it’s also there during the Halloween Party so that theory falls apart. If I had to guess, I think it’s more the feeling of everyone getting together to celebrate something. Much like a sporting event, there is something unifying in that making it more pleasant than just a typical day in the parks. While booking a ticket just based on the atmosphere alone is a bad idea, it is certainly part of what makes these parties special. I don’t think that Mickey’s Very Merry Christmas Party requires an extremely strict touring plan to accomplish everything that the park offers. I’ll offer up a general plan but as long as you prioritize a few things right as the party begins then seeing most of what the party offers shouldn’t be all that difficult, assuming you are staying the entire time. I would recommend staying past midnight so if that means arriving a little later to get some extra rest then do that. Here’s a brief plan, if there is something that doesn’t interest you then just skip it. Line up for characters. If possible, get to the park around 5 (or before) and grab a bite to eat and possibly ride something without much wait. Then, assuming there’s a character or two that you want to meet then get in line for them shortly after 6. This will be the longest wait of the night but you won’t be missing much, as no other entertainment has started at that point. Country Bears, Reindeer Wranglers, and Cookies. I should have just named this step ‘Heaven’. Most of this time is spent in Frontierland hanging out with the Country Bears and listening to the live band play. There’s a cookie stop near there at Diamond Horseshoe. Tortuga Tavern with their Snowman Pretzels and Pinocchio Village Haus with their multiple cookies are close by, as well, although in opposite directions. Mickey’s Once Upon a Christmastime Parade. I recommend seeing the parade twice because it’s that much fun. While it may be easier to see the 2nd one from Main Street, I usually try to on the first showing, and then just catch the 2nd showing without saving a spot. Tomorrowland Shows. After the parade hustle over to Tomorrowland to catch the shows there. You may not be able to make it over for the 9 PM Edge Effect show but will definitely catch the 9:25 Totally Tomorrowland Christmas Show. Holiday Wishes! Make your way back to the hub for Holiday Wishes! and enjoy the nighttime spectacular. Repeat shows, meet characters or watch anything you have missed. As I said, I like to watch the parade again at 11. If that’s not important to you then catch any shows that you might have missed, as we’ve been on a pretty tight schedule so far. Maybe you need to see that reindeer dance party or get more cookies too, there’s plenty of time for that during this slot. 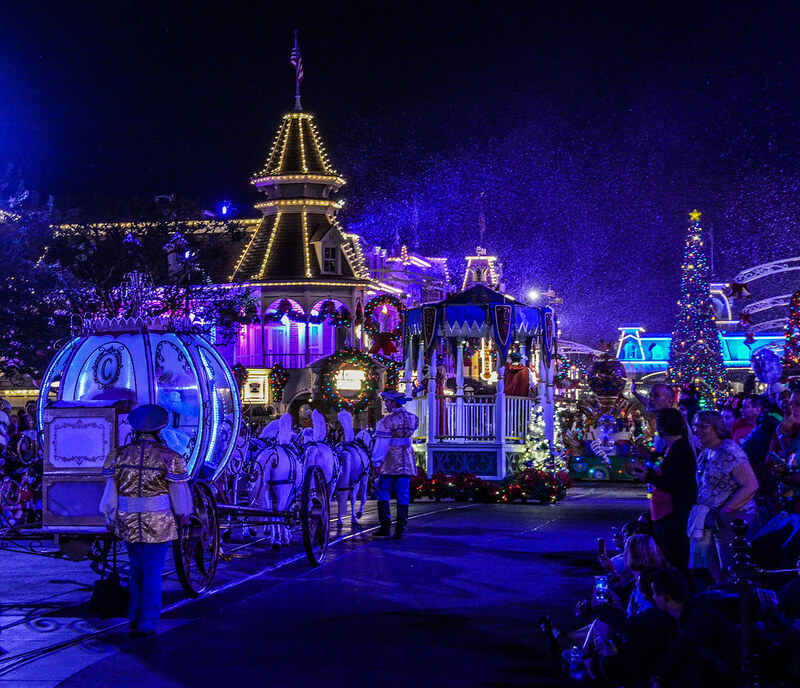 Catch the last show of Mickey’s Most Merriest Celebration. The last show of the night is at 11:55 in front of the castle. This is usually the least crowded of the showtimes and a good way to stretch out the evening. Of course, a number of those steps can be flipped around to match what you want. 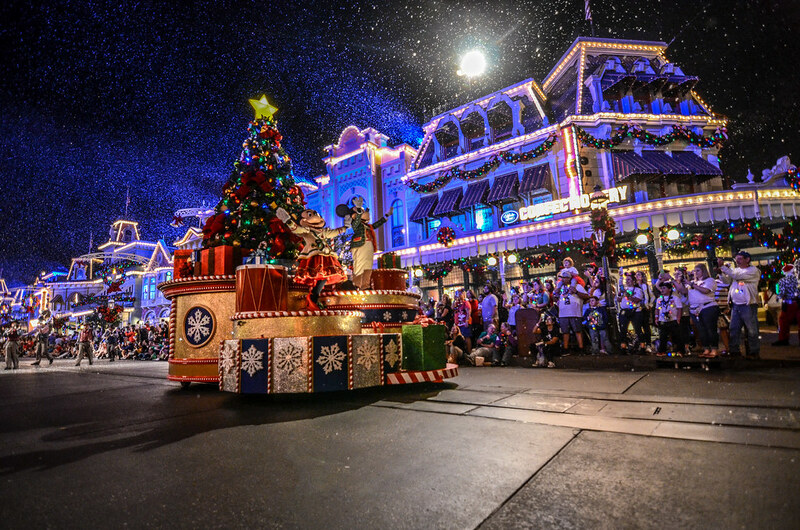 The evening is centered around the parade and Holiday Wishes, however you choose to fill the rest of it will be fun. I’m not a big fan of doing rides during these events as there are so many other options that aren’t typically offered that it seems like a waste of time/money. Having said that, if an attraction you love has a really short wait then jump in line! Is the Party Worth the Price? This all leads to the question of if Mickey’s Very Merry Christmas Party worth it? At roughly $100/ticket, the price tag is quite steep for an evening in Magic Kingdom. With that said, there is plenty of special entertainment offered and an incredible atmosphere at the party. Frankly, I can’t say whether the party is ‘worth it’ for you and your family or friends. If the entertainment that the party offers is intriguing to you then I think you’d have a great time and likely wouldn’t regret spending the money. Likewise, if you love Christmas then I have a hard time time seeing this as a waste of money. On the other hand, the price of this party (and Mickey’s Not So Scary Halloween Party) keeps climbing and at some point it will breach the point of any value. If this party was half or even 2/3 of the cost it currently is then it would unequivocally be a great value. Unfortunately, I can’t say that it is a great value. Instead, the party is a blast but the price is hard to swallow. For some people it will be worth it, for others it won’t be. To put it in simple terms, if you love Disney entertainment and/or Christmas then I’d say give the Mickey’s Very Merry Christmas Party a try. If neither of those things are your favorites then save your money. As I said in the 2019 update at the beginning of this post, I have a hard time recommending the party on dates that are over the $99 price. Speaking for myself, I just don’t think attending this party is worth that much. For first timers, I can certainly understand the intrigue and may even recommend it if this sounds up your alley. For those on the fence and attending during a more expensive window, the price is a big deterrent. If you do happen to be at Magic Kingdom during Christmas week, do not pay the $139 price for the party as Magic Kingdom does the same parade and has much of the same entertainment out during the regular theme park day. Plus, $139 is an absurd price for this. Ultimately, Mickey’s Very Merry Christmas Party can be a beautiful night filled with memories but we have a hard time fully recommending it due to the cost. Do you have any questions or thoughts about Mickey’s Very Merry Christmas Party? Let us know in the comments! Planning a trip to Walt Disney World? Check out our Disney World Trip Planning Guide to help you out. 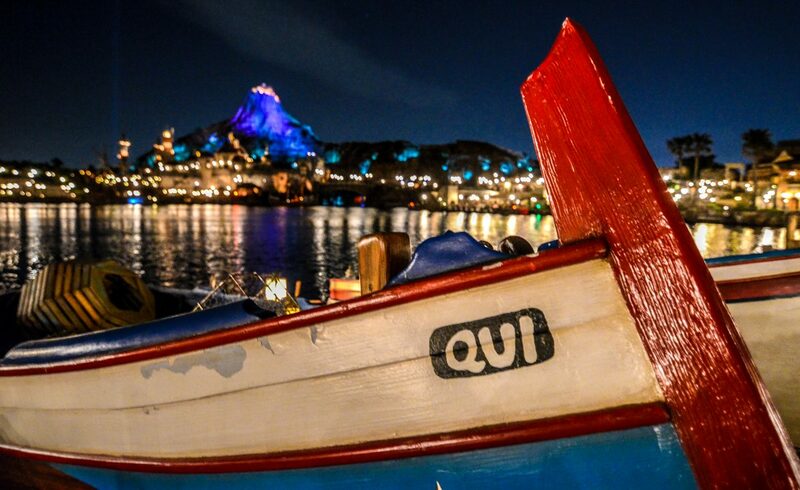 If you enjoy what you’re reading here on Wandering in Disney, you can subscribe to the blog via WordPress or email. All of those links are on the right side of this page. Thank you for reading, we really appreciate it!